very nice presents I took her a pair of vases. It was not late when we got home so I knit awhile on Days mittens I had a letter from Esther today and an invitation to Florence Works wedding next week. 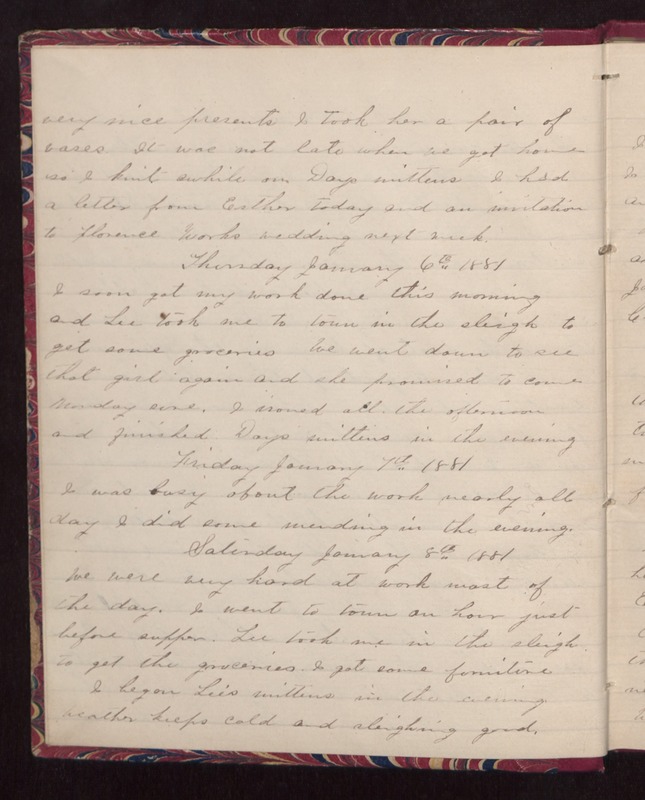 Thursday January 6th 1881 I soon got my work done this morning and Lee took me to town in the sleigh to get some groceries We went down to see that girl again and she promised to come Monday some. I ironed all the afternoon and finished Days mittens in the evening. Friday January 7th 1881 I was busy about the work nearly all day I did some mending in the evening. Saturday January 8th 1881 We were very hard at work most of the day. I went to town an hour just before supper. Lee took me in the sleigh to get the groceries. I got some furniture. I began Lee's mittens in the evening. Weather keeps cold and sleighing good.